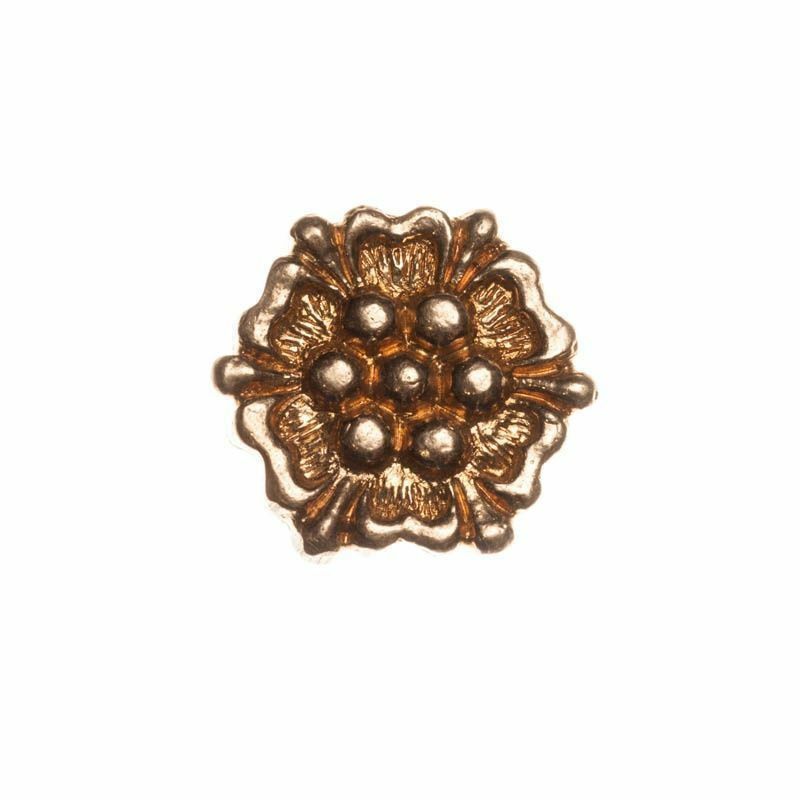 Medieval belt mount "Small rose"
Rose was one of the most popular flower ad symbol in medieval Europe. There is a national flower of England, though accessories with rose image were widespread among nobility and knight in Spain, Italy, and Germany. Also, we can see roses on medieval coat of arms. Belt, decorated with such rose-shaped bronze belt mount, will become perfect accessory for your medieval clothing or dress. Size: 28 mm Set includes five belt mounts “Rose”. In category “Belt mounts”, you may see various bronze attires for belt. .. Size: 35x17 mm Based on the archaeological finding .. Size: 22 x 25 mm Based on the Girdle from Siena (Metropolitan Museum). ..
Rose was one of the most popular flower and symbol in medieval Europe. There is a national flower of England. Accessories with rose image were widespread among nobility and knight in Spain, Italy, and Germany. Also, we can see roses on medieval coat of arms. Belt, decorated with such rose-shaped bronze eyelet mount, will become perfect accessory for your medieval clothing or dress. 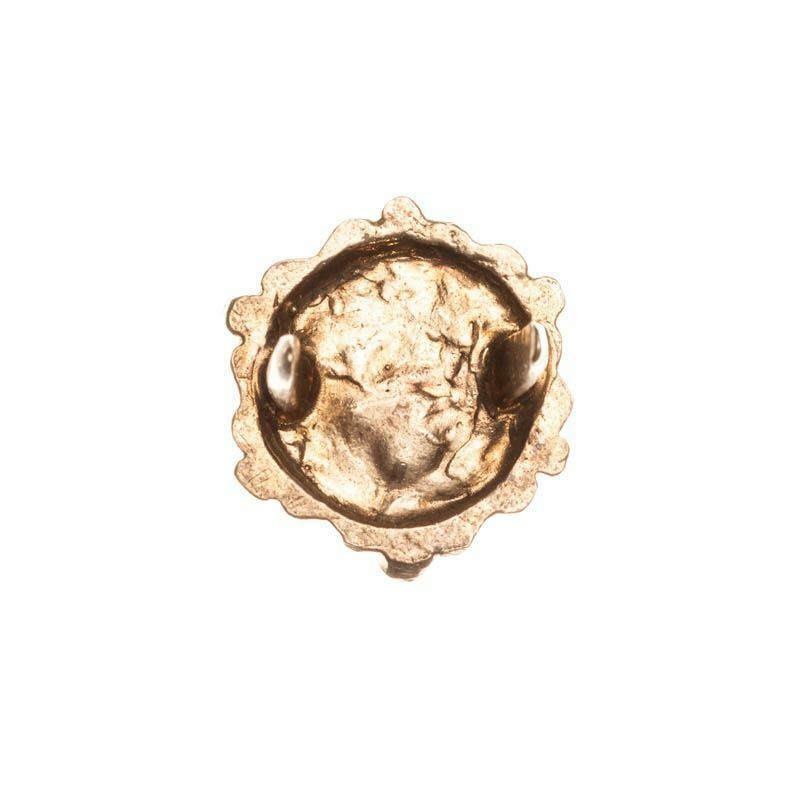 Diameter: 28 mm Set includes five eyelet mounts “Rose”. In category “Belt mounts”, you may see various bronze attires for belt. .. Cast belt mount of rectangular shape is handcrafted of top-quality bronze. Such mounts were often painted by Flemish masters and found during archaeological excavations. Rosettes inside the circles are typical ornaments of the XV century. Girdle pendant in the Gothic style will be perfect addition for belt, decorated with these mounts. Size: 30*40 mm Check out category “Belt mounts” to see more beautiful models of bronze fittings. .. Cast bronze mounts were decorating belt and baldrics of knights in medieval Europe. This bar-shaped mount is made by pictures from the book “Dress Accessories, c.1150- c.1450 (Medieval Finds from Excavations in London)”. We offer you to create unique accessory, which will be amazing addition to man’s medieval costume or woman’s dress. Size: 5*21 mm Set includes 10 bar-shaped mounts. In category “Belt mounts”, you may see various bronze attires for belt. .. In the Middle Ages, lion was a popular symbol of courage, might and dignity. It is often used in heraldry and you may see in coat of arms, so in accessories. This bronze mount in shape of lion with raised paw is based on the archaeological finding. Original girdle is kept in Baden-Baden museum now. Together with ornamented cast belt set and “A” mounts, these bronze mounts will create unique accessory for your medieval costume, just the same as original one! Size: 15*25 mm More models of handcrafted medieval mounts are available in category “Belt mounts”. ..
Handcrafted bronze belt mount in shape of “A” letter is based on the medieval girdle of the XIV-XV century, which is kept in Baden-Baden museum. Researchers assume that “A” could mean “Amor” (“Love” in Latin). Original belt has ornamented strapend and buckle and lion mounts as well. So, combining all these parts, you may design historically accurate medieval girdle. By your wish, we may cover this mount with enamel, as on the main photo. Please, choose the wished color in options. Size: 15*20 mm In category “Belt mounts”, you may see various bronze attires for belt. ..